The first step is get licensing out of the way. Determine before you start which licenses your client will need or already has available, as they will affect your architecture. Have handy the number of users that will be accessing your site, and whether they will be internal or external. (Hint: your scenario will probably be in one or more of the following granules 1240, 1260, 1280, 2450, or 2510). Some of these licensing options are very expensive and could change some of the requirements. If you’re lucky, you will find a third party component that fits the bill. In most cases you will end up needing to either custom build or build an integration component. Every situation is unique, but there are a few patterns that you’ll see more often with Dynamics NAV sites. If you’re lucky, you will find a website solution that is purpose built for the problem you’re solving. A retail system is a good example. In this scenario you just need to have a mechanism to synchronize the data, and often not in real-time. For example, prices can be updated in a batch process nightly from NAV into a retail system, and sales information can be grabbed from that system and put into sales journals and posted in Dynamics NAV. In this scenario you only need to custom build the synchronization component. This component could connect to either your business web services or do regular updates from a landing area in your Dynamics NAV database (for example writing sales into the sales journal, and potentially reading current pricing or inventory from Dynamics NAV). Sometimes you’ve got a website with a database that already exists, and you just need to grab some of the data and merge it with some other information. If you need to merge the data, and the data does not need to be real-time then your integration option looks similar to the 3rd party component web site. 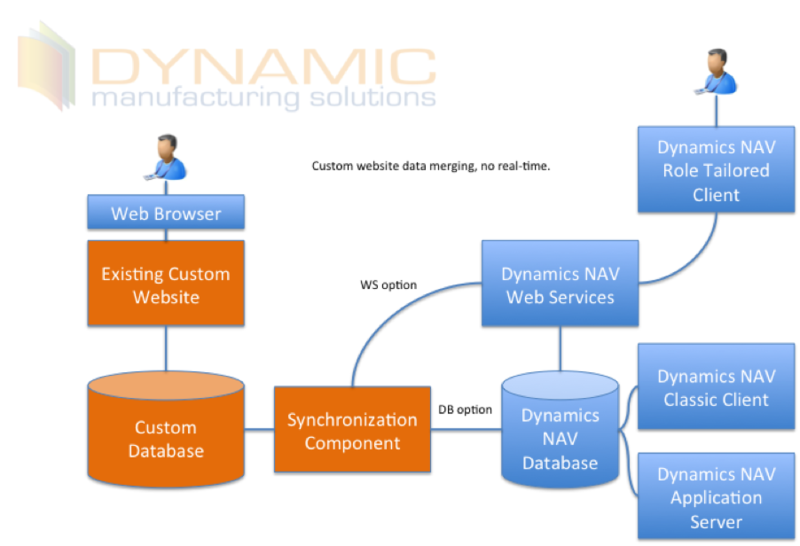 If it’s an internal website, or need real-time data then you can connect directly the Dynamics NAV SQL database or to the Dynamics NAV web services. There are many variations of the above. For example, you might want database replication to keep your NAV data available and not have web usage introduce risk or load on your company operations. There are several NAV interfaces, but you’ve really got two main options. RTC business web services (Dynamics NAV pages or CodeUnits exposed as business web services), or direct to SQL server. The best choice will really depend on your architecture, which is also affected by your licensing. Licensing (again). Every user would need windows CAL and a dynamics NAV C/AL. This option is fine for your existing Dynamics NAV users as that license fee would already have been paid, but it makes it more costly to allow access for your customers or vendors. It’s not an option at all for anonymous logins. Kerberos double (or more) hop. Having gone through this several times it’s doable, however be aware that some IT departments will not allow web accessible computers to delegate authentication, which is a key step in configuring double-hop to work properly. Determine now before you start whether this is a possible deployment scenario, because sometimes it’s a showstopper. Dynamics NAV 2009 web services are WCF based, which makes it very simple to connect to from ASP.Net based systems. This also provides the option to have your web site exposed with it’s own custom forms based authentication, while still connecting to NAV as a single application user (check your licensing options before you do this). This makes it easy to execute NAV business logic from within your custom website, and provide access to data. 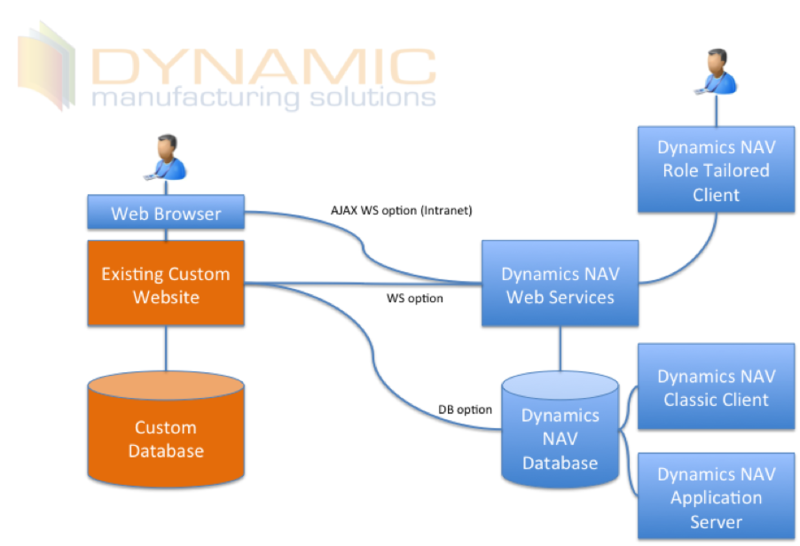 If you’re using Dynamics NAV 5 or earlier then web-services aren’t available as an option, and you will often need to just connect to SQL server directly. Even if you’re on 2009 or later, the downside to using the NAV web services is that it is not the most efficient communication available. For performance-minded applications this is not often a solution as you’ll have your website data layer, making an HTTP call to the web services, passing noisy XML data back and forth, and having that XML data serialize and de-serialize both on the side of Dynamics NAV and your custom website. No business logic is available. In a future blog post we’ll show how to use a new framework (MVC.Net) to connect to SQL server directly for the situations where the Dynamics NAV web services are not an option, and get around the table-naming problem.